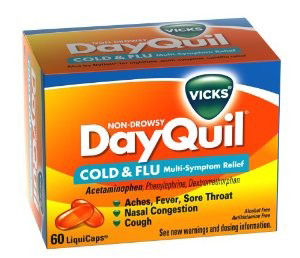 DayQuil is a medicine made by Vicks, and it is intended to relieve the symptoms of the flu and common cold. It was introduced in 1974 as “DayCare”, but it was later reintroduced in 1992 as Dayquil. It is available in syrup or capsule form, and its nighttime counterpart Nyquil is also popular, although this variety contains antihistamine sedatives. Dayquil does not contain those same sedatives, so it is not expected to cause drowsiness and provides an acceptable cold and flu relief for daytime hours. Previous recipes for the medication contained pseudoephedrine, but it has been replaced in the U.S. with phenylephrine. Canada and other countries still produce their variety with pseudoephedrine. Dayquil contains three main ingredients: acetaminophen, pseudoephedrine, and dextromethorphan. Acetaminophen is used as a fever reducer and a pain reliever. Dextromethorphan is used as a cough suppressant, as it reduces the activity and signals in the part of the brain that control coughing. The ingredient pseudoephedrine is a decongestant, and it works to shrink the blood vessels located within the nasal passages. This is because dilated blood vessels are often responsible for nasal decongestion, otherwise known as a stuffy nose.